The Old Red Lion Theatre is situated above The Old Red Lion pub, one of the oldest pubs in Britain (having been built in 1415). The 60-seat studio space opened in 1979, and began establishing its reputation as one of the most prominent London fringe venues in the presentation of new and emerging talent. The theatre was briefly threatened with closure in the late 1980’s, due to stricter fire regulations, but funds were raised to keep it open. 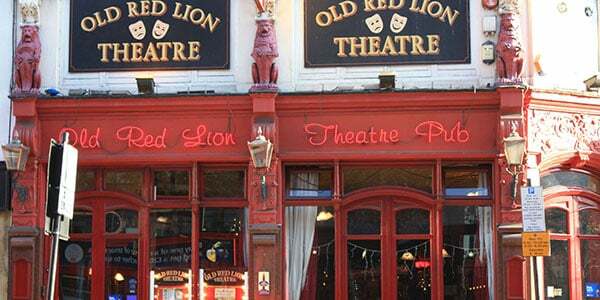 To promote new theatre, the Old Red Lion has an open submission policy (the literary department often reading over 1,000 scripts a year), a Writers Bloc night (an organisation specifically seeking fresh work) as well as an open hire slot on Mondays for visiting companies. To encourage attendance from all demographic, the theatre has a Pay What You Can night every Tuesday. The theatre also regularly hosts live music.